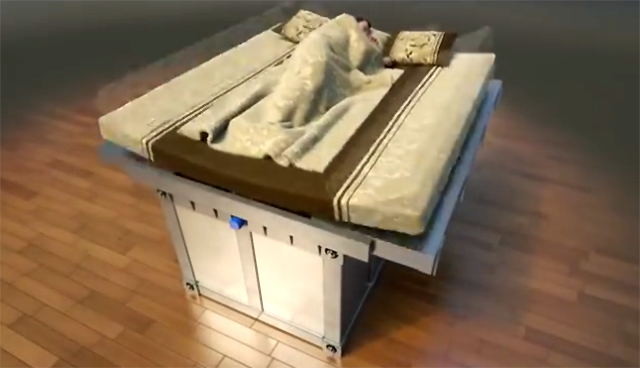 A 66-year old retired Chinese inventor has designed an earthquake proof bed that has been described by some members of the media as being scarier than an actual earthquake. 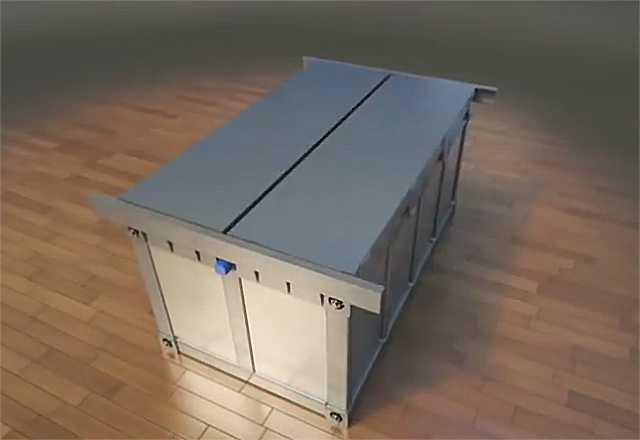 Wang Wenxi’s “Anti Earth-Quake Bed” video has been circulating the Web, showing users how his modular bed design would react in the case of such a catastrophe. 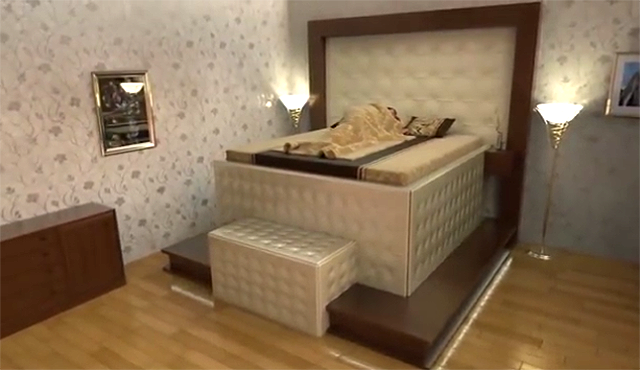 The rather regal looking beds (depicted in several styles) turn into what looks like reinforced metal vaults – or a “custom steel coffin,” as one YouTube user described. 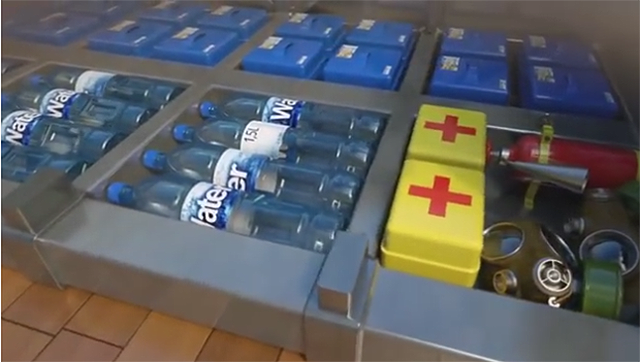 Once entombed inside, there’s a survival kit waiting for you including water, food, fire extinguisher, gas masks, medical supplies and more. The Daily Mail reports that the inventor received a patent for his concept in2010, but even they haven’t found much additional info on this project. According to The Times of India, Wenxi said “The Wenchuan and Yushu earthquakes caused heavy causalities, so I thought the most serious thing I could do was to invent something to reduce the toll in lives.” “I think my life-saving bed is useful, especially suitable for brick-and-concrete low-rise buildings and bungalows,” he added. 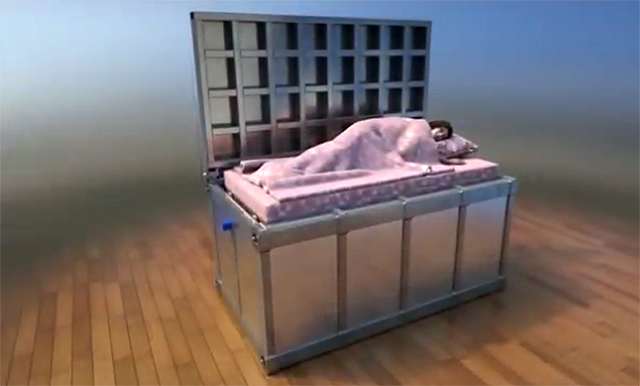 Whether the coffin-like strongbox invention will ever come into being is questionable. If it does, you can say you saw it here first. Meanwhile, here’s the video that has social media all atwitter. All images are video screen captures.